Corals are simple soft bodied marine animals which secrete a hard skeleton composed of calcite. They are frequently preserved as fossils and constitute a large and varied group of organisms. Corals belong to a group of animals called the Cnidarians, and most are marine. They may be sessile, meaning sedentary, while others are free swimmers. The polyp, or sessile form, may occur as an individual or with others form a colony. Corals that exist as solitary individuals is that such as Caninia. When corals are colonial, they consist of many individuals, such as Hexagonaria. Some Cnidarians spend their entire life as a polyp, while others alternate between polyps and medusoid generations during their life cycle. The other members of this group are the sea anemones, jellyfish, and hydroids. These last three members of the Cnidarians are entirely soft bodied animals, they are seldom found as fossils, apart from a few very rare examples consisting of the impressions of their bodies preserved in sedimentary rocks. Corals belong to the class Anthrozoa, and they belong to three subclasses. There are the rugose corals (Rugosa), the tabulate corals (Tabulata), both of which are extinct and are essentially confined to the Paleozoic era. The last subclass, the scleractinian corals or hexacorals (Scleractina), first appeared in the Triassic period and are widely distributed today. The rugose corals are solitary, or compound Paleozoic corals, and they are also called tetracorals, horn corals, or cup corals. Their calcareous skeleton, called a corallum, is divided by vertical radial partitions, the septa. The corallum's upper surface is a cup-shaped hollow called the calice. The skeleton is made up of vertical septa. The septa consists of transverse tabulae, and dissepements, which are smaller convex plates lying between the septa. Solitary rugose corals have a conical corallum, which can be straight, curved, or cylindrical. Tabulate corals, now extinct, take their name from their most prominent feature, their tabulae. They are numerous, and usually horizontal, but may also be domed or funnel-shaped. Axial structures are quite rare. The Tabulata are compound corals, with the corallum composed of slender corallites partitioned transversely by numerous tabulae. The corallum is usually small, and is calcareous. Usually the corallum is fasciculate, and may be massive or of irregular bun shape. Fasciculate forms may have corallites branching irregularly, and may be joined at intervals by connecting pores or tubes. In a few forms the corallites join laterally to form a series of meandering walls one corallite wide. Some massive forms have mural pores, communicating holes in the corallite walls. In some other forms, the corallites are separated by common calcareous tissue called coenchyme. Tabulate corals' calice is usually only a few millimeters across, round, elliptical or polygonal in shape. Scleractinians may be either solitary or colonial. The colonial forms may be massive, encrusting, branching, or sheetlike. They have a light, porous skeleton consisting of radially arranged septa, usually with some form of external sheathing that forms a cup. The development of scleractinian corals differs from that of other corals in its growth patterns. First six septa are formed, followed by another six septa that are secreted between the first six septa. This is followed by twelve septa, then twenty four septa, and so on. The scleractinian corals are those that most of us easily recognize as corals, and what we imagine corals to look like, based on what we see in our waters today. Although corals first appeared in the Cambrian period, some 570 million years ago, they are extremely rare as fossils until the Ordovician period when rugose and tabulate corals became widespread. Rugose corals became dominant by the middle of the Silurian period, and became extinct early in the Triassic period. Tabulate corals occur in the limestones and calcareous shales of the Ordovician and Silurian periods. Their numbers began to decline during the middle of the Silurian period and they finally became extinct at the end of the Permian period Scleractinian corals diversified during the Mesozoic and Cenozoic periods and are at the height of their development today. With the exception along the Pacific coast, scleractinians were fairly rare in North America until the until the Cretaceous Period, when they built reefs in Texas and Mexico. 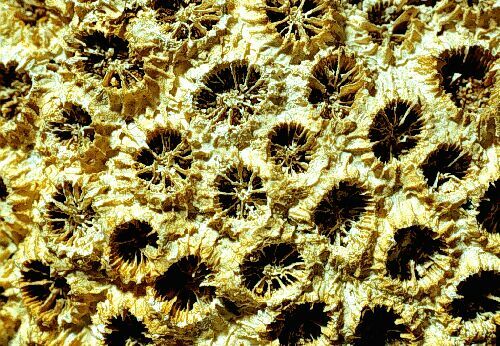 By the late Cretaceous Period, non-reef building corals were common in many faunas of North America. In the Oligocene, reefs appeared near the shore in the southeaster United States, West Indies, and Mexico. During the later Tertiary, non-reef builders were more abundant than the reef builders in North America. Corals are not restricted to just reefs, many solitary corals may be found in rocks were reefs were not present, such as Cyclocyathus which occurs in the Cretaceous Gault clay of England. As well as being important rock builders, some corals are useful as zone fossils, enabling geologists to date the age the rocks in which they are found, particularly those found in the limestones of the Carboniferous period. To see what we have found while hunting for fossils, just click on the icon below. Please keep check back to see what we have added. Please send any suggestions for the Corals page to us. For more information on The History House, contact The History House.